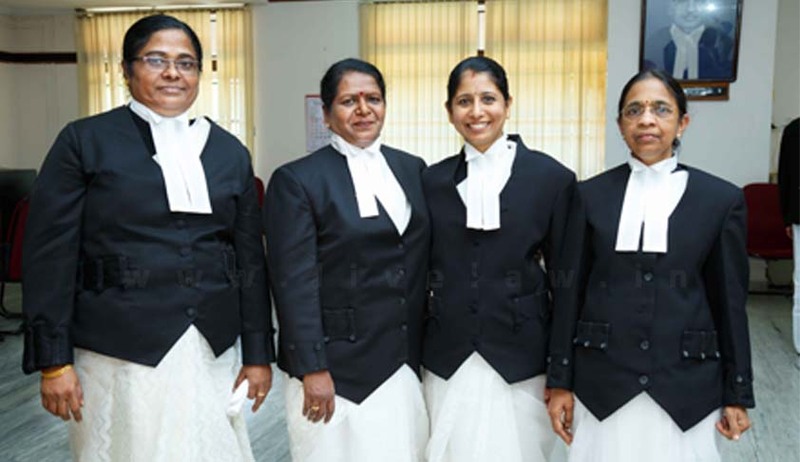 For the first time in the judicial history of Kerala, the High Court of Kerala has got four women sitting Judges. The historical moment was created when Justice V. Shircy was appointed on Thursday. Other three female sitting Judges her are Justice P.V. Asha, Justice Anu Sivaraman and Justice Mary Joseph. Justice PV Asha and Justice Anu were appointed from the bar, while Justice Mary Joseph and Justice Shircy were appointed from the bench. Speaking to LiveLaw Justice Fathima Beevi, the first Woman Judge of Supreme Court of India said “It is a welcome step. When Mr HR Gokhale was the Law Minister of India he had initiated the steps to appoint several lady Judges in High Courts. I was at the lower judiciary at that time. The Supreme Court and the Government should appoint more women in the High Court because the proportion of lady Judges in High Courts is very low. It has to be raised”. Justice P.V. Asha, a graduate from Vimala College, Thrissur, was appointed as a permanent Judge of the Kerala High Court in May. She obtained her law degree from Government Law College, Ernakulam, and enrolled as an advocate in 1983 establishing herself in the areas of constitutional and civil law. Justice Anu Sivaraman is the daughter of Justice Sivaraman Nair, former Judge of High Court of Kerala, and was sworn in as additional Judge of the High Court in April last year. She did her schooling from St. Teresa's Convent Girls High School, St. Teresa's College and later at Maharaja's College, Ernakulam. She also has a degree in English Literature and a Diploma in Journalism from Kerala Press Academy. She obtained a law degree from Government Law College, Ernakulam, and soon enrolled as an advocate and served as standing counsel for the Kochi Corporation for 10 years. She was then a senior government pleader and special government pleader. Justice Mary Joseph was sworn in as additional Judge of the Kerala High Court with Justice Anu Sivaraman in April last year. Having graduated from SH College, Thevara, she obtained a law degree from Maharaja's Government Law College, Ernakulam, and L.L.M Degree from Cochin University. She enrolled as an advocate in 1986 and started practice in civil and criminal laws at Kerala High Court and various subordinate courts in Ernakulam. Before becoming the district Judge in Kerala in 2001, she held the post of additional district government pleader and public prosecutor at district court, Ernakulam. Justice V. Shircy was the principal district and sessions Judge of Thiruvananthapuram. She was recently in the news when as a principal sessions Judge, she awarded death sentence to Nino Mathew and life imprisonment to Anu Shanti in the Attingal murder case. Kerala has always made history, then be it for the state with the highest literacy rate or for having a female-to-male ratio higher than 0.99. The first female High Court Judge and Supreme Court Judge also belonged to the state. Justice M. Fathima Beevi , the first woman appointed as a Judge in the Supreme Court was also from Kerala. Not just in India, she was the first Asian woman to become a Supreme Court Judge and the first Muslim woman to be appointed to any higher judiciary. Justice Anna Chandy was the first woman in India to become a High Court Judge. Chandy was appointed as a Munsif in Travancore in 1937, which made her the first woman Judge in India. In 1948, she was raised to the position of district Judge. She became the first female Judge in an Indian High Court when she was appointed to the Kerala High Court in February 1959.